Have you ever wanted to visit the ‘old country’, wherever that may be for you–the land where your parents, or grandparents, or great-grandparents, spent their childhood? So did author Mark Rotella. After years of listening to his family’s stories of life in Calabria, he convinced his reluctant father to accompany him to the village of Gimigliano, for just a day. When they unexpectedly connect with distant relatives, Rotella becomes immersed in the life he previously only heard about, returning to Calabria again and again. 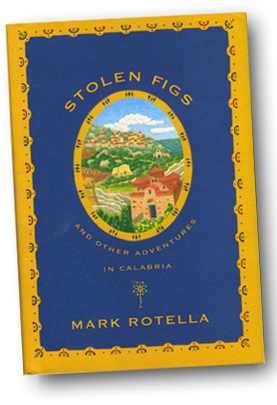 A memoir and travel story combined, Stolen Figs lets us share Rotella’s discoveries in clear, inviting language. He shares the flavor of his experiences–the aroma of homemade soprasetta, the taste of fresh artichokes on pizza, the tingling fear of driving unfamiliar backroads that seem hostile. Rotella had the advantage of speaking Italian as he ventured through Calabria, but still ran into communication issues with the Calabrian dialect. He also describes a visit to a Greek-speaking village, an area mentioned in last week’s post. I enjoyed his adventures, and recommend his book–a mini-escape to Calabra. This entry was posted in Books and tagged book review, Calabria, Gimigliano, Mark Rotella, memoir, Stolen Figs, travel. Bookmark the permalink. I just finished reading this wonderful book which had been recommended to me by another Italian-American I met on a train going to Florence!I highly recommend it!